We know the way to get a top price, quick sale, and it’s not using the discount-sign-in-the-yard, list-it-in-the-MLS, and-a-wing and-a-prayer marketing plan. 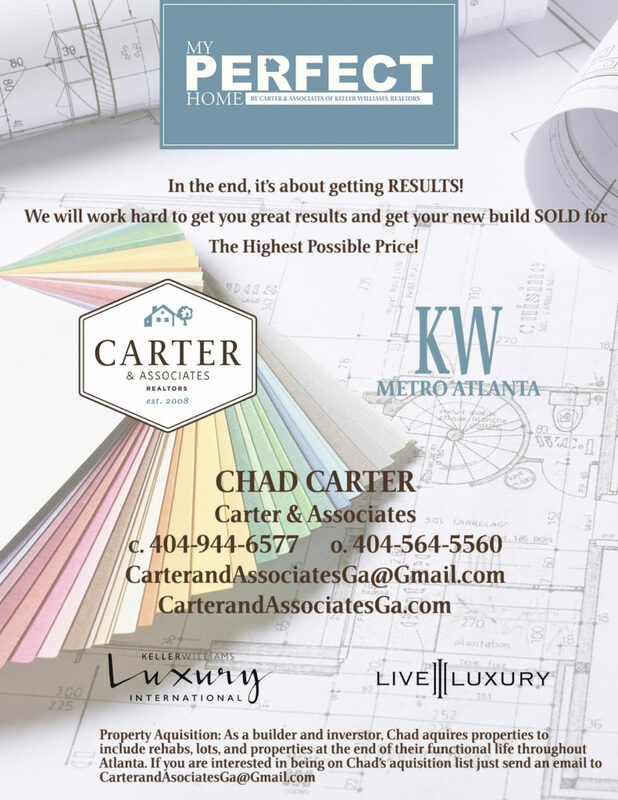 The Carter & Associates team consists of savvy professionals that use the latest technology and marketing strategies to sell new homes faster and to the right buyers. We deploy a comprehensive Internet and social media marketing campaign that is arguably proprietary and ensures your home is seen globally. We will be heavily financially invested in the sale of your home and will be in this transaction with you. We will STAGE your new construction for FREE. We also attend all showings! For our partnership, we only ask 5% commission fees. Bottom line: Carter & Associates will bring tremendous value to your transaction and can ensure you a sell on your terms at the maximum price, which will increase and maximize your return. Please let us know if you would also like to be on our acquisitions list. Just email us the details of your investment property parameters. Strength of our team. You’ll have career professional Realtors® assigned to your home, and an entire team will be working together on the sale of your property. This dynamic team includes closing processors, lenders, inspectors, appraisers, architects, attorneys, design teams, marketing and graphic experts, and a social media expert all at our disposal and working for us on your transaction. Expert property “readiness” advice. We will walk through the home with you to make suggestions for preparing this property for a faster sale and to net more money for you. This can include design recommendations. We also build homes so we get it! Fair realtor® fees. We charge a 5% listing fee to the builders we partner with (for properties listed at more than $750,000). Project management documentation. Sale preparation checklist and schedule to be provided to ensure we are on the same page for all presale and marketing efforts, and expectations for performance are defined. Determining list price: Setting a current market-value asking price — from the beginning — will solicit the most views for your home, since price is the number one criteria for most buyers. Determining a specific asking price can be the most difficult aspect of selling your home, since you want the maximum sales price without overpricing. At over $750,000 we are looking at only 4% of the buyer pool and at over $1,000,000, less than 2%. There are no second chances once your home is listed and time on the market will devalue your investment. Let our team assemble a viewable current extensive comparable market analysis to assist you in determining an appropriate listing price. Staging advice and coordination. We stage new construction homes for FREE. We will provide all that is needed to ensure your home shows in its best light. We attend all showings! This is critical. About two out of five purchases will be from out of state buyers, and here in Intown Atlanta, one of five is from out of the country. These buyers will view five other influential neighborhoods with luxury listings. 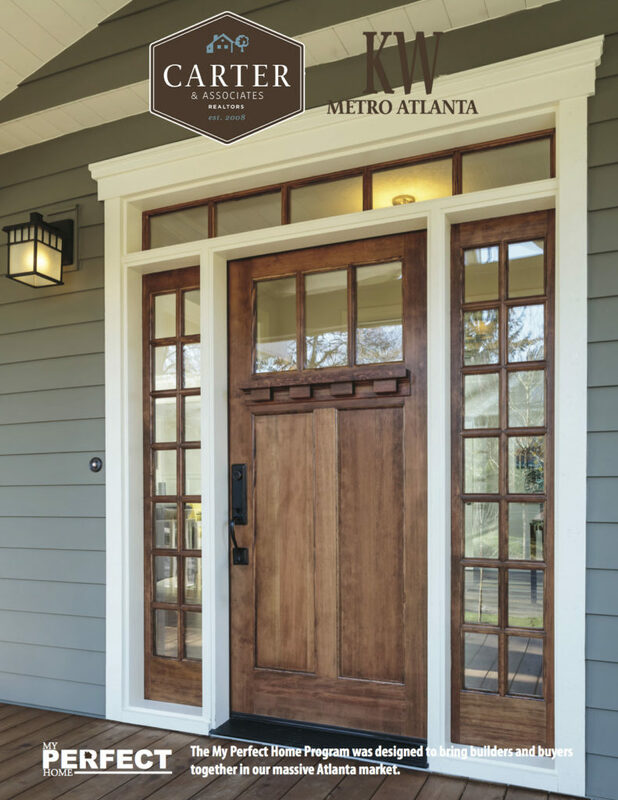 As we live and work right here in Intown Atlanta, my presence and knowledge of both the build and the neighborhood will help buyers see the value in the lifestyle that comes with this home. These efforts will help us discern ourselves from the competing builders and neighborhoods. Seller disclosure package. This ensures your property will be appropriately positioned in the marketplace. My Perfect Home new construction program implemented on your new build! Luxury Estate “Home for Sale” yard sign. This branded signage will include property-specific riders to include My Perfect Home riders. Estate signage shows this is an important home. Luxury architectural rendering. This signage to further accompany My Perfect Home display. Realtor® outreach. We will directly e-mail the 1,000+ Keller Williams, realtors® agents in our database. Outreach includes our relocation department, where we hold contracts with over 200 large Atlanta based companies as their relocation brokerage firm (Coca-Cola, Home Depot, Georgia Pacific, etc.). Professional photography. High end photography for pre-sale, and again (with home staging) should we not sell the home prior to completion. The professional property photos and virtual tour will be uploaded to over 500 hundred web sites for maximum buyer exposure (locally, nationally, and internationally!). Glowing property description. 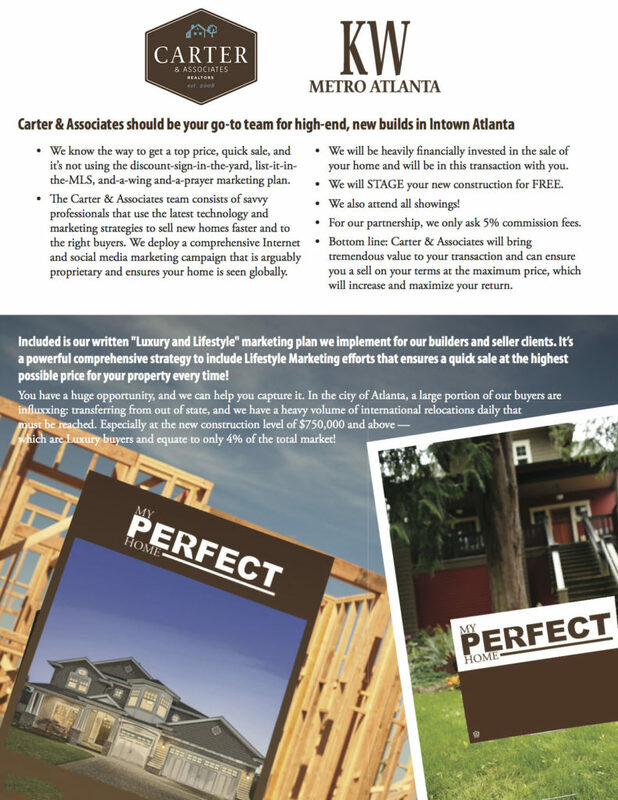 We’ll prepare a detailed list of features that your property offers for our marketing materials and strategy. A focus on story telling. Most agents primarily focus on the facts and features of a home when they expose it to the market. Our focus is on telling the story of your home and its special benefits. This includes the story of your amazing community. Buyers are purchasing and will pay more for a “lifestyle”. The difference is subtle but powerful. All of our marketing, including property brochures, print marketing, web marketing, virtual tours, etc., are focused on telling the story of your home. Buyers only care about the facts and features of your home after they have connected with it emotionally. High-end collateral. Custom, full-color property brochures designed, professionally printed, and delivered. Strategic mailers. We’ll distribute “Just Listed” or “New Construction-Coming Soon” postcards to homes in your area. An excellent promotion of your property, this custom made marketing piece will include photographs and important features of your home, so your neighbors can tell their friends. Neighbors often know others that want to live in your neighborhood. Social media attack plan. We’ll implement a social media marketing campaign on Facebook and several other social media web sites. Links to the virtual tour, photos, and detailed property description will be included. Unique URL. Our digital marketing plan also includes a unique website. If your address is 123 Lullwater, we will create a unique Web address such as LullwateronthePark.com. This will appear on all marketing materials. Open house. An open house will be scheduled the first Sunday after the listing goes live in FMLS and GAMLS. Sense of urgency from realtor®. By having two realtors® assigned and a team working on your home we can ensure every inquiry about your property will be responded to in a timely manner. Agent caravan. We will feature your property on broker tour/caravan the first Tuesday after listing. Ask us how we create a highly attended soiree every time! Real-time, realtor® feedback. We’ll gather feedback from local realtors® and send summarized feedback reports weekly — including any new recommendations on making the property the best fit for prospective buyers. Managing the details of a probate, trust or conservatorship estate is complicated enough. Choose a real estate partner who will treat the process respectfully and seamlessly. The key to a successful sale is to list your property with an agent who understand both the complexities of fiduciary sales and the needs and challenges that may arise from your unique probate estate, trust or conservatorship situation. If you are faced with the sale of real property through probate proceedings, you’ve come to the right team: Carter & Associates. Straightforward, non-technical communication with all parties, including families. Seamless liaising among families, attorneys, accountants, trustees, conservators and court personnel. Garnering the best possible price for the trustee and heirs. Minimal stress from you, our client(s) – and representation of your best interests, all around. A luxury and lifestyle marketing plan to get the property sold quickly for the highest value and least liability possible. We assist our probate clients whom are short on time and/or overwhelmed by the process, with our turn-key property preparation and sales service that saves time, energy, money and anxiety. Our full service probate and estate sale program provides trustees with liquidation assistance in the estate sale of personal items through a direct estate sale, online item auctions, relocation of unsold items, salvage item clearance, cleaning of the property and preparation of the home for sale to include minor repairs and even free staging! Carter & Associates has a network of more than 130 investors and buyers to market your properties to. If your estated home is not in a condition where it could transact on the open market, then such an investor pool (investors, rehabers and builders) can help get the property to a place to ensure a competitive and highest price sale. Working with a probate, trust and conservatorship realtor estate resource that doesn’t have these relationships would be risky; your property could be challenging to sell, or fall in and out of contract.